puja has a lot of photos near the top. This is not by chance. 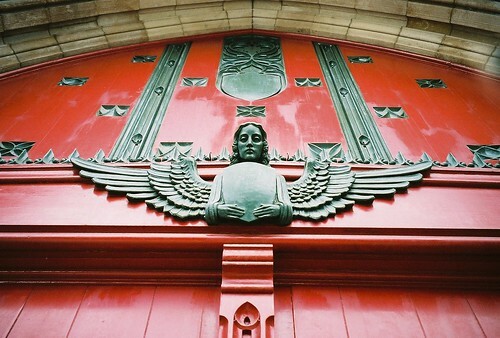 I think that Kalamazoo in Photos by Erin Dorbin is probably a pretty cool book. Call it a hunch. I’m really surprised that there aren’t more photos of the Mirrored Building. It’s been too long since I’ve seen a show at Club Soda. I think I want that bike too. Or a moped. How many other cities actually produce a recognized sign of spring? Kalamazoo has some great old houses. And buildings. And restaurants and shops. It’s interesting to see the interplay between old and new. There’s no way I have the time this morning to explore the Kalamazoo Group, but I have to say their group description is great. That Kalamazoo Promise thing could be so big. Imagine – education as a birthright. 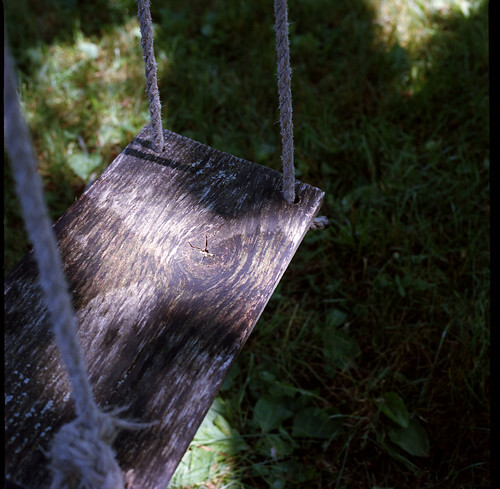 Taken in a Kalamazoo backyard with a Hasselblad, I believe. View it bigger. Truck 17 In front of Old Central, photo by Stoney06. 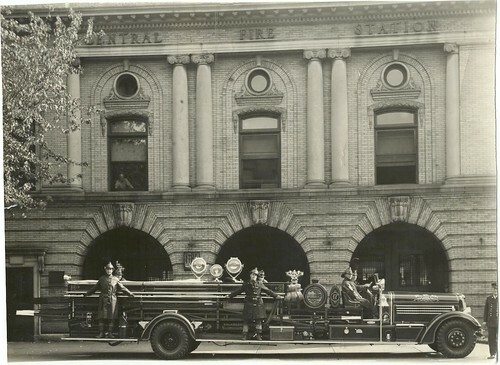 Joel Dinda knows old photos, so it’s not at all surprising that he found this great collection of historical photos from Brian Stone of the fire stations, fire trucks and the men of the Kalamazoo. An added plus are his informative captions such as the one for the above: Old Central Station Kalamazoo Michigan. Truck is a 1936 Seagrave City Service Ladder. “Pride of the Department”. Indeed. View the photo large and you can see that’s true. 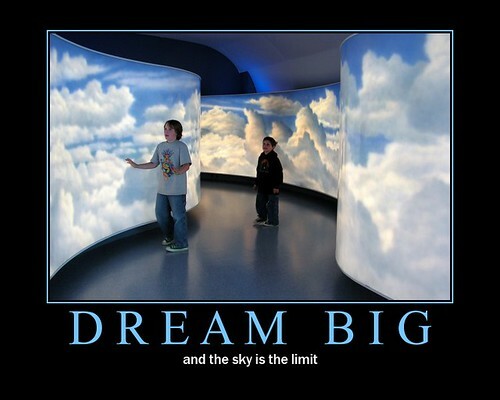 I found this photo via the revamped Michigan eLibrary. It’s from the John Todd Photographic Collection at the Portage District Library. The collection contains over thirteen-thousand negatives of Kalamazoo, Kalamazoo County communities and southwest Michigan taken from 1940 to 1981. It includes all manner of pictures including aerial photos of Kalamazoo and the surrounding area. Night view of the Uptown Theater located at 247 North Burdick Street in downtown Kalamazoo, Michigan with the camera looking towards the southwest. As of 2006 this theater has been demolished and replaced with the Kalamazoo Valley Public Museum. North Burdick Street in this block no longer functions as a roadway but has been converted into a pedestrian mall. Gibson, Inc., General Assembly Room, 1936. “One section of the general assembling room.” Photographed by Mamie L. Austin. Visit the Gibson, Inc. Photo Gallery at the Kalamazoo Public Library for many more photos and a brief history of Gibson in Kalamazoo (includes suggested reading!). In 1898, Orville Gibson was awarded the patent for an “Improved Mandolin,” using principles that could be applied also to “guitars, mandolas, and lutes.” The invention was that of a back, neck, and ribs structure carved from one piece of wood, with an arched soundboard and slightly hollowed neck … This archtop guitar design, influenced by violin construction, marked the beginning of a significant development in American guitar making. Read more and see some photos at Guitar by Orville Gibson at the National Music Museum. Also check out History of Gibson from Gibson, Inc. and this page from FlyingVintage.com with information and pics of the Kalamazoo factory. The Gibson section is just one of over 100 short stories and tours of historic photographs and information about the people, places, events and businesses of Kalamazoo in the Kalamazoo Public Library’s Clarence L. Miller Family Local History Room. Henderson Castle, photo by Kalamazoo Richard. Richard posted several shots of this Kalamazoo landmark to the new Historic Michigan pool on Flickr. One of his shots is of the Michigan Historic Marker which tells us it was built in a neighborhood designed by Kalamazoo military regalia manufacturer Frank Henderson. 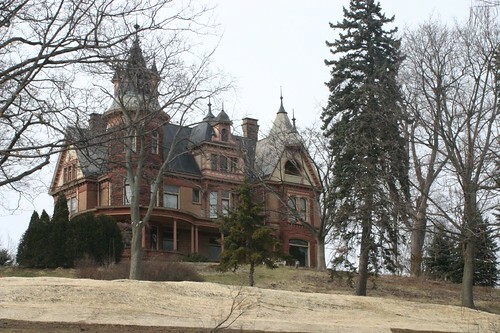 The Queen Anne style house–always called “The Castle” by local residents because of its ornate style and imposing hilltop location–was designed by C. A. Gombert of Milwaukee, Wisconsin, and cost $72,000 to build. With seven baths, a thirteen-head shower, an elevator, a third-floor ballroom, and a hot tub on the roof (added later) the 25-room castle exemplifies high society and expensive tastes. The castle’s exterior is made of Lake Superior sandstone and brick, and the interior wood includes mahogany, bird’s eye maple, quartered oak, birch, and sycamore. Henderson Castle is currently a bed & breakfast (visit Henderson Castle B&B site). Dreaming, originally uploaded by aricee. Before you all conclude I have an unhealthy obsession with the AirZoo, let me explain that the main purpose of this selection is to introduce you to the very fun Flickr Toys from fd that allow you to make posters, montages, comics and a whole lot of other things including billboards of your kitty. In addition to playing with Flicker Toys, aricee takes beautiful and thoughtful photos of the natural world and her family.